The innovation of medical devices is a useful and fulfilling activity. Medicine in general is fulfilling as it provides instant gratification to the physician and instant relief to the patient. Medical device ideas arise from the needs identified during the patient-healthcare team interactions. 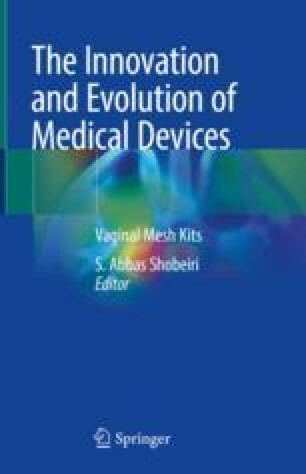 The journey from ideation to a commercially successful medical device product is the focus of this chapter with emphasis on pitfalls of medical device development with the use of vaginal mesh kits as a specific example. NHS England. Design for patient safety. A system-wide design-led approach to tackling patient safety in the NHS. London: Department of Health; 8 Oct 2003. http://www.nrls.npsa.nhs.uk/resources/collections/design-for-patient-safety/?entryid45=59881. 84 p.
U.S. Food & Drug Administration. Medical devices. Premarket approval (PMA). Last updated 27 Mar 2018. https://www.fda.gov/medicaldevices/deviceregulationandguidance/howtomarketyourdevice/premarketsubmissions/premarketapprovalpma/. Accessed 24 Apr 2018. World Intellectual Property Organization (WIPO), Geneva. Statistical Country Profiles. United States of America. http://www.wipo.int/ipstats/en/statistics/country_profile/profile.jsp?code=US. Last updated March 2018. Acceessed 23 Apr 2018. MedTech Europe. The European medical industry in figures. [Internet]. Brussels: MedTech Europe; 2018. http://www.medtecheurope.org/medtech-industry-in-figures. Accessed 25 Apr 2018. World Intellectual Property Organization (WIPO), Geneva. Record year for international patent applications in 2016; strong demand also for trademark and industrial design protection. PR/2017/804. Geneva; 15 Mar 2017. http://www.wipo.int/pressroom/en/articles/2017/article_0002.html#designs. Accessed 3 Feb 2018. Worldwide Medtech Sales by EvaluateMedTech® Device Area: Top 15 Categories & Total Market (2016 & 2022). http://info.evaluategroup.com/MTWP2017-EMF.html. Makower J, Meer A, Denend L. FDA impact on U.S. medical technology innovation: a survey of over 200 medical technology companies. November 2010. [Internet]. http://www.medtecheurope.org/node/246. Accessed 3 Feb 2018. Lee K. Designing the OR of the future [Internet]. Healthcare design. Construction and engineering. 24 Sep 2015. http://www.healthcaredesignmagazine.com/trends/construction-engineering/designing-or-future/. Accessed 2 Feb 2018. Wieringa F.P. Pulse oxigraphy: and other new in-depth perspectives through the near infrared window [Internet]. Erasmus University Rotterdam; 2007. Available from: http://hdl.handle.net/1765/10031. Accessed 24 Apr 2018. Want to please patients? Maybe you should start a specialty hospital. 1 Apr 2015. [Internet]. Advisory Board (advisory.com). https://www.advisory.com/research/health-care-advisory-board/blogs/at-the-helm/2015/04/patient-experience-and-specialty-hospitals. Accessed 2 Feb 2018. Moore BJ, Steiner CA, Davis PH, Stocks C, Barrett ML. Trends in hysterectomies and oophorectomies in hospital inpatient and ambulatory settings, 2005–2013. HCUP Statistical Brief #214. Nov 2016. Rockville: Agency for Healthcare Research and Quality. http://www.hcup-us.ahrq.gov/reports/statbriefs/sb214-Hysterectomy-Oophorectomy-Trends.pdf. U.S. Food and Drug Administration. Center for Devices and Radiological Health. Urogynecologic surgical mesh: update on the safety and effectiveness of transvaginal placement for pelvic organ prolapse. July 2011. https://www.fda.gov/MedicalDevices/ProductsandMedicalProcedures/ImplantsandProsthetics/UroGynSurgicalMesh/ucm262301.htm. Accessed 6 Feb 2018. U.S. Food and Drug Administration. Center for Devices and Radiological Health. Medical device recall report FY2003 to FY2012. www.fda.gov/downloads/aboutfda/centersoffices/officeofmedicalproductsandtobacco/cdrh/cdrhtransparency/ucm388442.pdf. Accessed 2 Feb 2018. Waardigheid en trots. Implementatie toolkit technolgie in de zorg. www.waardigheidentrots.nl. Utrecht. Accessed 24 Apr 2018. Moscovitch B, Rising J, Daniel G, Drozda J. Time to fix the black hole in Medicare data. [Internet] 29 June 2016. Health Affairs (Blog). https://www.healthaffairs.org/do/10.1377/hblog20160629.055612/full/. Accessed 6 July 2017.